As product owners or developers, we probably have a good handle on which core assets we need to make a website work. But rarely is that the whole picture. How well do we know every last thing that loads on our sites? Want to be able to make something like that? Follow along. A manual audit may seem like pointless drudgery. Why do this by hand? Can’t we automate this somehow? That’s the whole point. We want to achieve mindfulness—not automate everything away. When we take the time to consider each and every thing that loads on a page, we get a truer picture of our work. It takes a human mind to look at every asset on a page and assign it a purpose. This in turn allows us to shape our data in such a way that it means something to people who don’t know what acronyms like CSS or WOFF mean. Besides, who doesn’t like a nice pie chart? Get your performance data in a malleable format. Go item by item, assigning each asset request a purpose. Calculate totals, and modify data into easily understood units. The audit may take half an hour to an hour the first time you do it this way, but with practice you’ll be able to do it in a few minutes. Let’s go! To get started, figure out what URL you want to evaluate. Look at your analytics and try to determine which page type is your most popular. Don’t just default to your home page. For instance, if you have a news site, articles are probably your most popular page type. 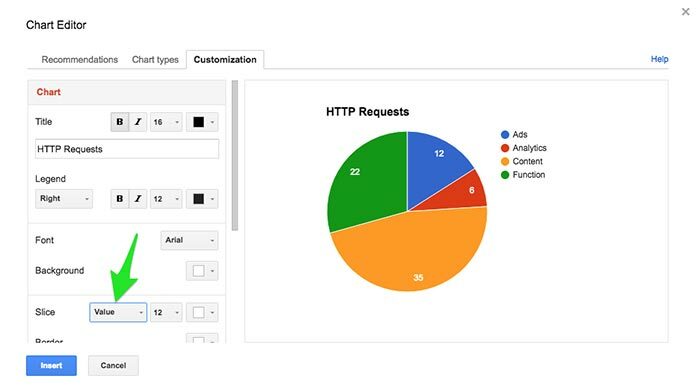 If you’re analyzing a single-page app, determine what the most commonly accessed view is. You need to get your network activity at that URL into a CSV/spreadsheet format. 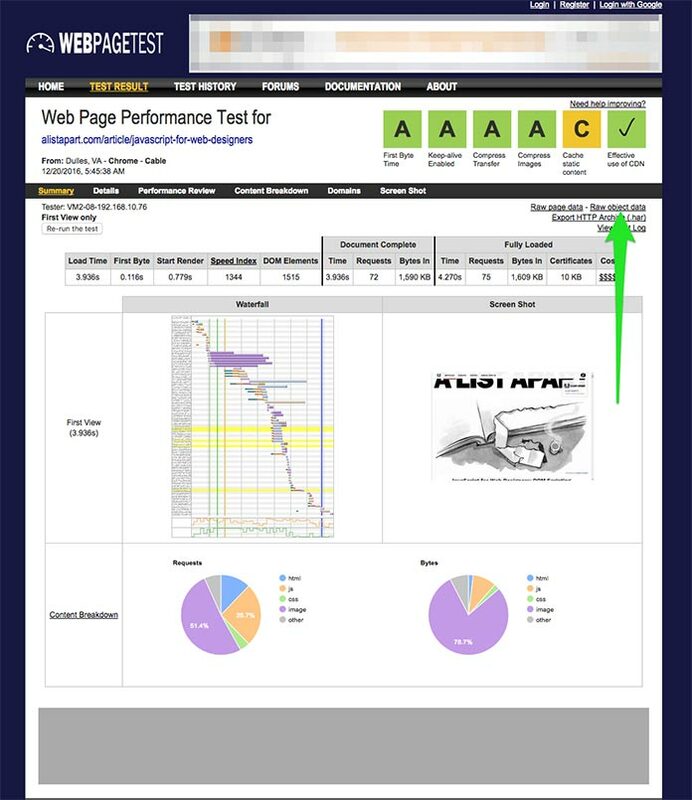 In my experience, the easiest way to do this is to use WebPagetest, whose premise is simple: give it a URL, and it will do an assessment that tries to measure perceived performance. Head over to WebPagetest and pop your URL in the big field on the homepage. However, before running the test, open the Advanced Settings panel. Make sure you’re only running one test, and set Repeat View to First View Only. This will ensure that you don’t have duplicate requests in your data. Now, let the test run—hit the big “Start Test” button. Once you have a results page, click the link in the top right corner that says “Raw object data”. A CSV file will download with your network requests set out in a spreadsheet that you can manipulate. Now, open the CSV file in your favorite spreadsheet editor: Excel, Numbers, or (my personal favorite) Google Sheets. The rest of this article will be written with Google Sheets in mind, though a similar result is certainly possible with other spreadsheet programs. The other columns you can just ignore, hide, or delete. Or even better: select those three columns, copy them, and paste them into a new spreadsheet. With your pared-down spreadsheet, insert a new first column and label it “Purpose”. You can also include a Description/Comment column, if you wish. Analytics URLs like googletagservices.com, googletagmanager.com, google-analytics.com, or js-agent.newrelic.com. Ad URLs like doubleclick.net or googlesyndication.com. Just doing the steps above will likely be eye-opening for you. Stopping to consider each asset on a page, and why it’s there, will help you be mindful of every single thing the page loads. 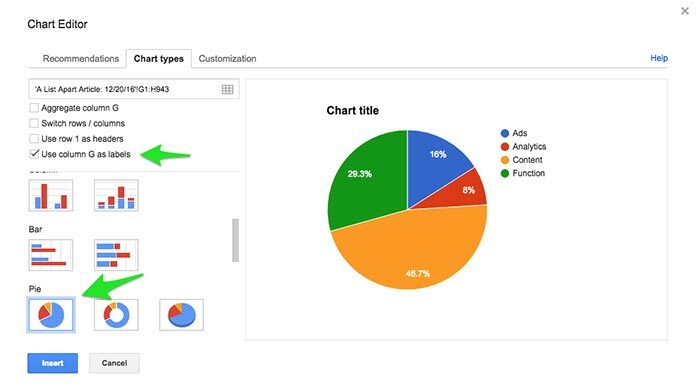 Before you can generate fancy pie charts, you’ll need to do a little more spreadsheet wrangling. Forewarned is forearmed—extreme spreadsheet nerdery lies ahead. Translation: you’re simply dividing the amount in the cell from the previous column (E2, in this case) by 1000. You can highlight this new cell, then drag the corner down the entire column to do the same for each row. This assumes that your purpose assessment is column B. If it’s not, swap out the “B” in this example for your column name. This formula will go down column B and output a result if it’s unique. You only need to enter this in the first cell of the column. This is one reason why having consistency in the Purpose column is important. 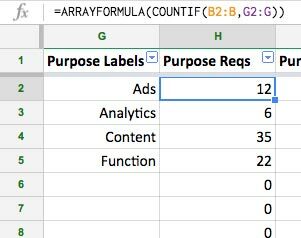 This formula will also go down column B, and do a count if it matches with something in column G (assuming column G is your Purpose Labels column). 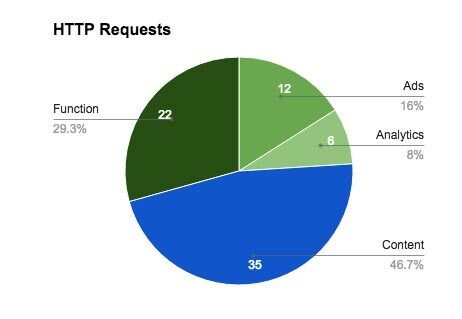 This is the easiest way to total how many HTTP requests fall into each purpose. 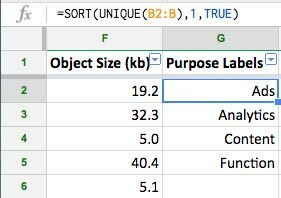 This will total the data size in column F if its purpose in column B matches G2 (i.e., your first Purpose Label from the section above). In contrast to the last two formulas, you’ll need to copy this formula and modify it for each row, making the last part (“G2”) match the row it’s on. In this case, the next one would end in “G3”. With your assets grouped by purpose, data translated to KB, number of requests counted, and download size totaled, it will be pretty easy to generate some charts. Under the “Customization” tab, edit the Title to say “HTTP Requests”; under “Slice,” be sure “Value” is selected (the default is “Percentage”). We do this because the number of requests is what you want to convey here. Go ahead—tweak the colors to your liking. And ditch Arial while you’re at it. The download-size-by-purpose pie chart is very similar. 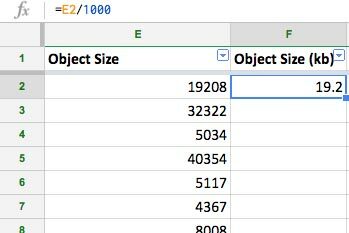 Select the columns Purpose Label and Purpose Download Size (columns G & I in my example); then go to Insert > Chart. Scroll down the list of possible charts and choose a pie chart. Be sure to check the box marked “Use column G as labels”. Under the “Customization” tab, edit the Title to say “Download Size”; under “Slice,” be sure “Value” is selected as well. We do this so we can indicate the total KB for each purpose. Or, you can grab a ready-made template. If you want to see a completed assessment, check out the one I did on an A List Apart article. I’ve also made a blank file with a lot of the trickier spreadsheet stuff already done. Feel free to go to File > Make a Copy so you can play around with it. 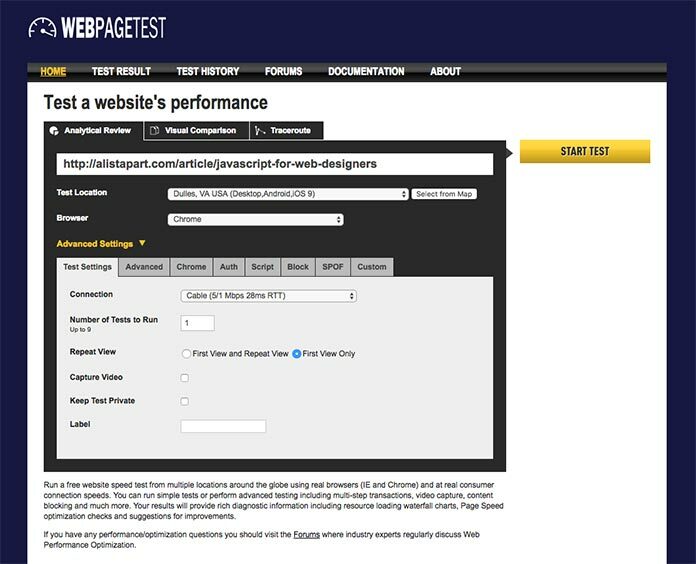 You just need to get your page data from WebPagetest and paste in the three columns. After that, you can start your line-by-line assessment. If you show your data to a stakeholder, they may be surprised by how much page weight goes to things like ads or analytics. On the other hand, they might respond by asking what we should be aiming for. That question is a little harder to answer. Some benchmarks get bandied about—1 MB or less, a WebPagetest Score of 1000, a Google PageSpeed score of over 90, and so on. But those are very arbitrary parameters and, depending on your project, unattainable ideals. My suggestion? Do an assessment like this on your competitors. If you can come back to your stakeholders and show how two or three competitors stack up, and show them what you’re doing, that will go much further in championing performance. Remember that performance is never “done”—it can only improve. What might help your organization is doing assessments like this over time and presenting page performance as an ongoing series of bar charts. With a little effort (and luck), you should be able to demonstrate that the things your organization cares about are continually improving. If not, it will present a much more compelling case for why things need to change for the better. Your charts’ usefulness will vary according to the precise business needs and politics of your organization. Because you’ve ascribed purpose to your asset requests, you’ll be able to offer data like that. I once worked with a project manager who started pushing back on such requests because I was able to give them easy-to-understand data of this sort. I’m not saying it will always turn out this way, but you need to give decision makers information they can grasp. Remember, too, that you are in charge of the Purpose column. You can make up any purpose you want. Interested in the impact that movie files have on your site relative to everything else? Make one of your purposes “Movies.” Want to call out framework files versus files you personally author? Go for it! I hope that this article has made you want to consider, and reconsider, each and every thing you download on a given page. Each and every request. And, in the process of doing this, I hope you are equipped to call out by purpose every item you ask your users to download. That will allow you to talk with your stakeholders in a way that they understand, and will help you make the case for better performance choices. Chip Cullen is a senior front-end developer at PBS. He cares deeply about performance, accessibility, and design systems. He began his career as a designer, and through various stops along the way has made the switch to development. He lives outside of Washington, DC, where he enjoys running, roughhousing with his kids, cooking for his wife, and watercolor painting. Glad you enjoyed the article, and thank you for the recommendations! Glad you liked it, Shardanand! An article that resonates with us, many clients aren’t convinced about spending money on website speed, even though every piece of research shows customers leave if a page doesn’t start to load in a couple of seconds & isn’t usable in 3-4! We also find that although we design for speed initially & use caching, that manual image optimisation & detailed element analysis is really key to speed. Looking at Google Page Speed Insights or GTmetrix only tells half the story, as unlike WebPageTest you can’t use location based results & get a realistic picture for country specific sites. @Ruqshana @Insite – glad you liked it! @Nurza – glad you like the article! @Creative Solutions – I’m not sure what you mean, exactly. Can you be more specific? Love this, great philosophy and very practical. thanks Chip. great one! thanks for the good work.